«« previous: Today’s Quiz: What am I? 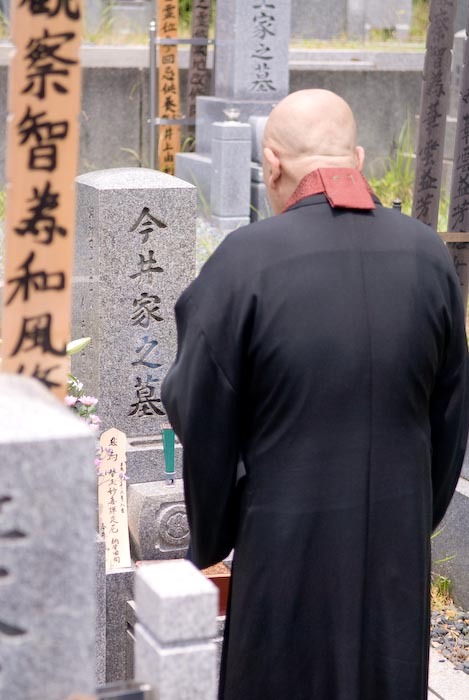 Fumie's Grandmother, Kine Imai, passed away at the end of April. 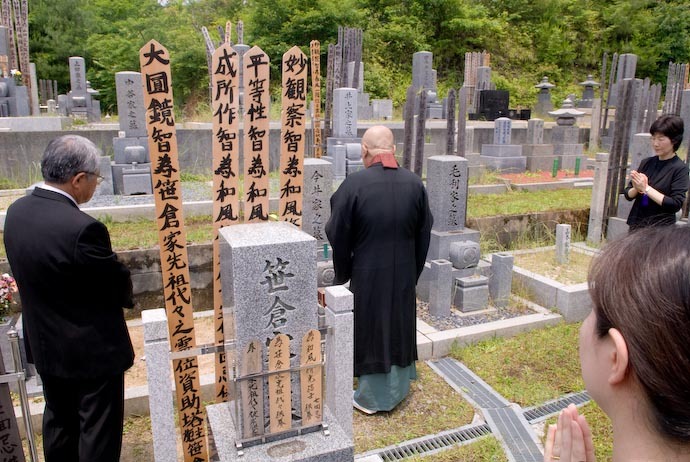 This past weekend was the second part of the funeral, the kotsuiri – 骨入 – the “placing of the bones”. A month or so ago, as part of the main funeral, the body was cremated such that there were still some rather large chunks of bone remaining. 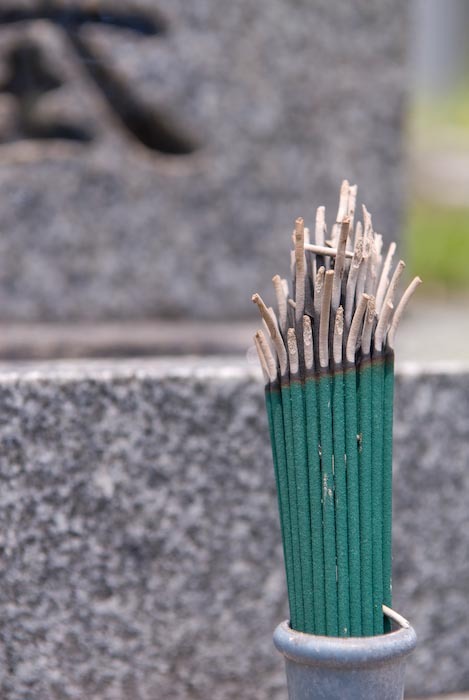 A typical Japanese (Buddhist) funeral includes a ceremony where family members use chopsticks to pluck certain bone fragments with symbolic meaning from the ashes, placing them into a small pot (as shown here), and we all did this, including five-year-old Anthony. 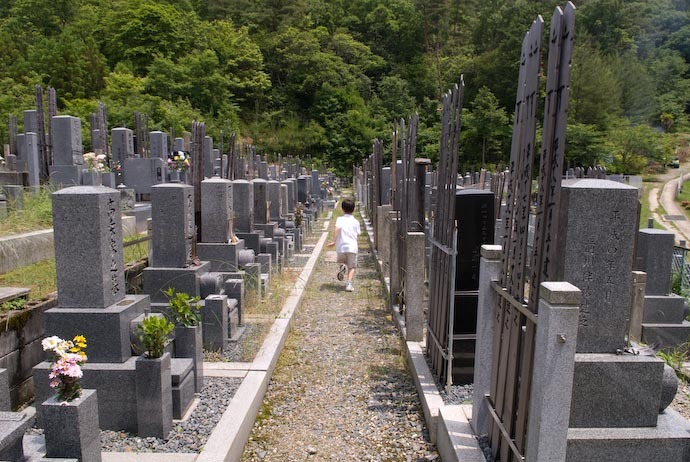 It's a remarkably calming event, solidly and purposefully demarcating the boundary between earthly life and death, providing a strong measure of finality and “closure” to the family. These bone fragments are kept in a small ceremonial pot for a month or so, allowing the deceased time to make the long and difficult trip to Heaven. 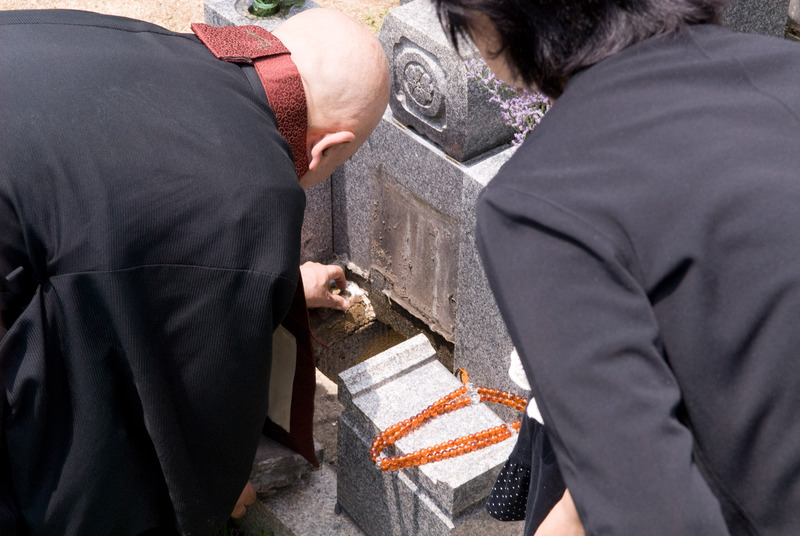 Then, its time for what amounts to burial, the placing of these small bone fragments under a family gravestone. The Buddhist priest kneels on the pillow seen in the lower left of the picture above, and chants while occasionally using the instruments arrayed around him. To his left is a large metal pot that sings a beautiful, rich, deep tone when struck with a soft mallet. To his right is a smaller metal “drum” with a harder wooden mallet that makes a pure, piercing, high-pitched metal tone. These nice-sounding instruments combined with the monk's excellent voice to make a pleasing, somewhat mesmerizing chant. 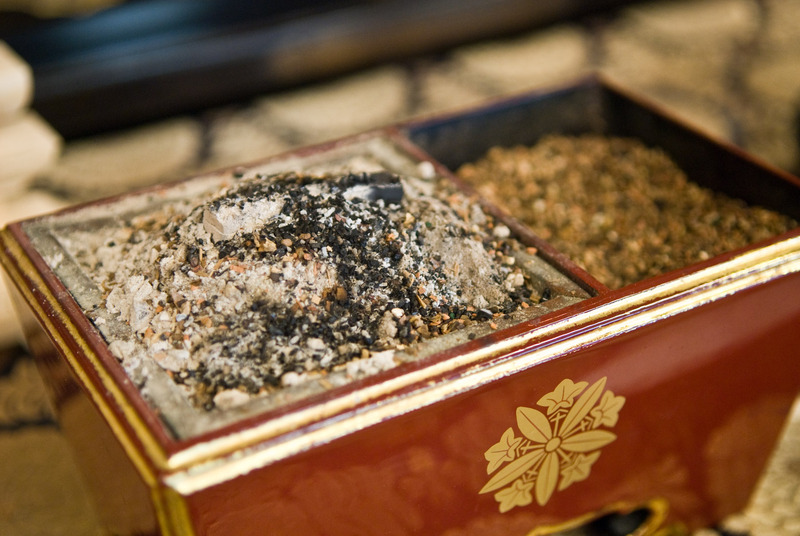 In the center of the picture above is a small red box holding incense; behind and slightly above it is the white box holding the pot of bones. Further behind is the temple's statue of (I assume) Buddha. It dates from the 1600s. 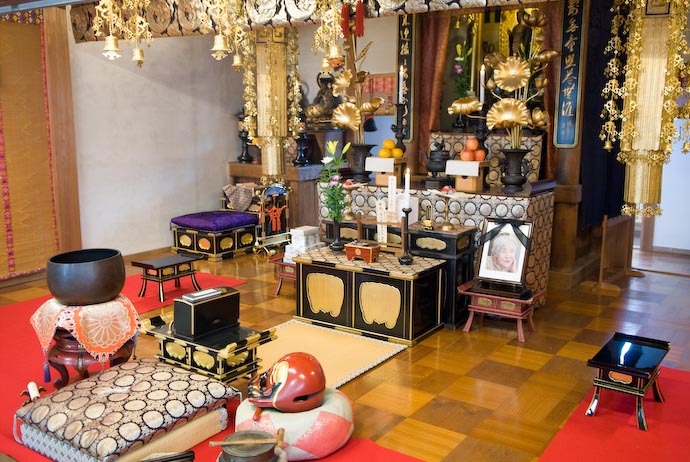 Part of the ceremony involves each family member placing three pinches of incense from the compartment on the right onto a hot coal in the compartment on the left. We did the same thing during one of the funeral ceremonies in April, again here, and a third time during another ceremony later in the day. 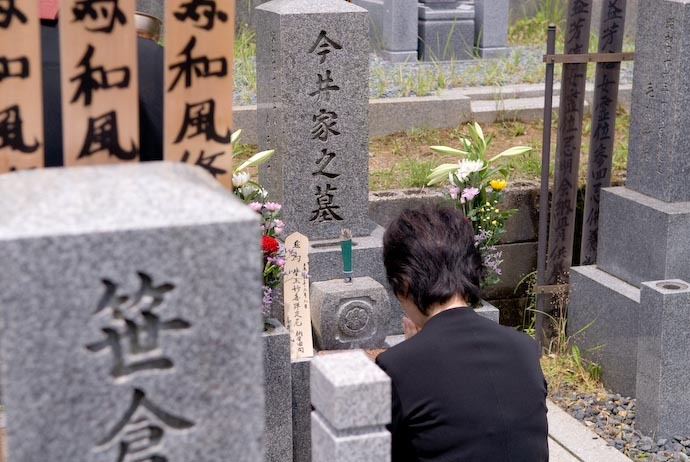 Each family member then used chopsticks to move the bone fragments from the pot to a small cloth pouch, and we all went to the grave site a few miles away. The wording on the stone says “Imai Family Grave” (“Imai” being the family name). Fumie's grandfather's bones are also under there. After that, we all went out for a nice lunch. Fumie's brother lives two hours away, and Fumie's dad is usually on business in Malaysia, so it was nice to be all together. I’ve been visiting your site for a while now and I wanted to thank you for the incredible pictures you are so generous to share. It is also very generous of you and Fumie to also share photos of such a personal time in your family’s life. 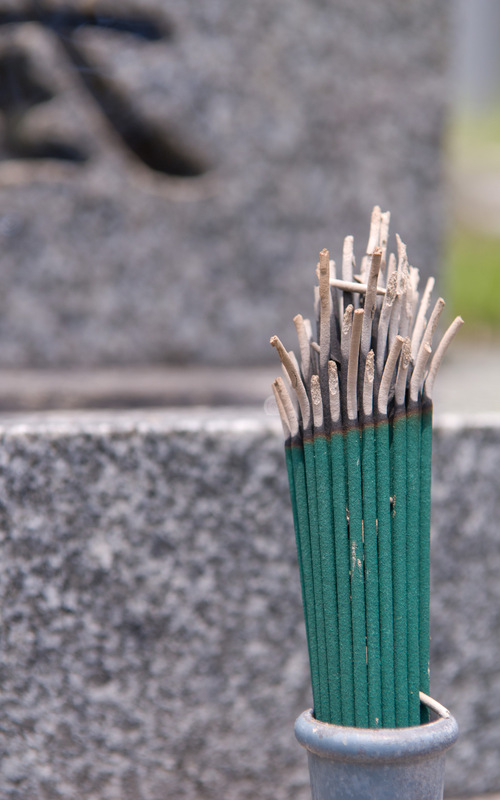 I wanted to personally thank you for sharing with all of us who visit your blog a moment in time that all of us unfortunately experience with a loved one. You have my deepest condolences.